......the page title got you to look didn't it? Common question; "What do you do besides sell Wilwood kits?" The answer is LOTS! 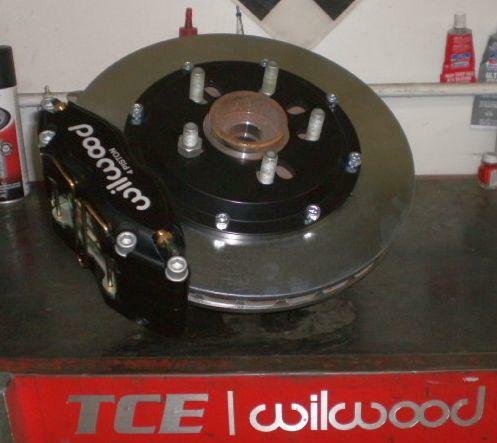 While TCE has been a Wilwood dealer since 1993 we got started in the big brake business by way of doing custom work. And it's still part of the daily grind. Rather than try to talk about these projects, let's take a moment and highlight them. This page is dedicated to the extensive custom kits TCE has done for customers. Got a special project you need some help with? It all starts and ends here. *A lot of images below use our mock-up rotor plates for easy bench work- that's the funky plate you see! Not often TCE gets a call for a MB build...in fact I think this is a first. Customer wanted to update the reliability and funtion of his mid 60s MB190 with disc fronts. The old drums were shot and fade a common issue on the back roads of Hollywood CA. The shop sent a spindle for reference and we went to work trying to balance form, funtion, fit, and budget. 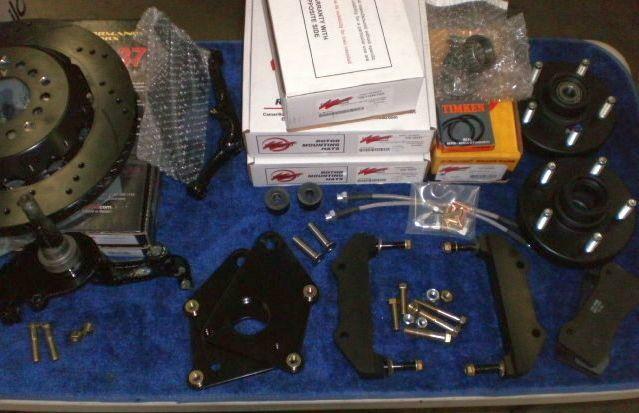 The end result: a 12.2" kit with heavy Wilwood GT castings, and fit with the DP6 caliper. A great combo for the lower to mide weight car. And hopefullly ideal for this customer's needs! A simply design really we were luck to do minimal fit on box stock Wilwood product to get things lined up correctly. Simple, clean and very effective. The customer wanted to do something more beefy for his off road Jeep build. Requiring a move to 20s this one did the trick! We had to make significant mods to the steel fabricated upright he had. Not an easy task. There were caliper mounts that were whoefully under engineered for the weight of the vehicle. While we could not really remove them we added our own to suite. 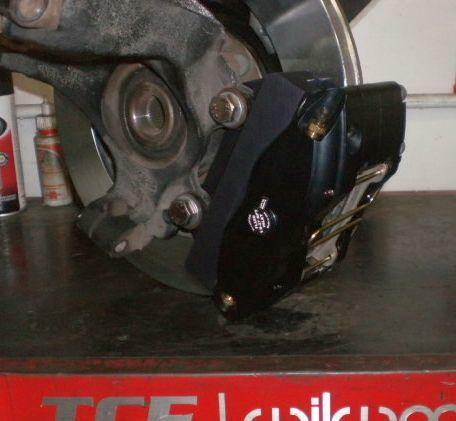 Then fit custom radial mount brackets for the TC6R calipers followed by the standard 2pc hats and 16" rotors. The final product turned out very well. 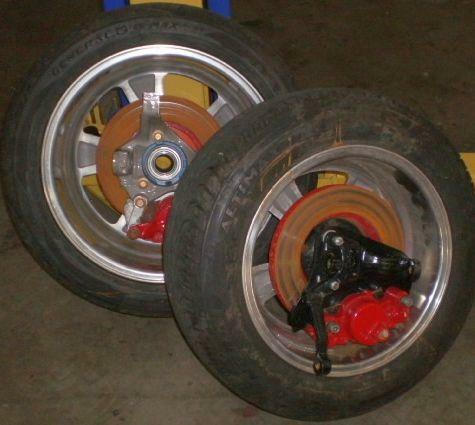 Not cheap...in fact quite costly at over $3000 but that's due to the weld and machine work to the upright more so than the brakes. Got BIG old car? 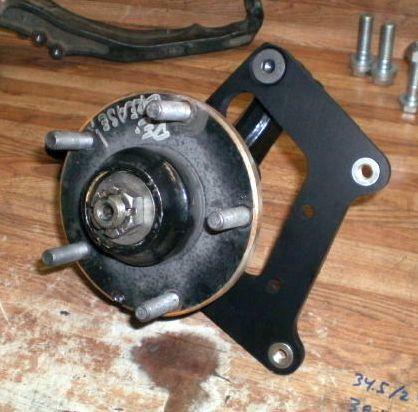 Need big brakes for your big wheels? No problem! 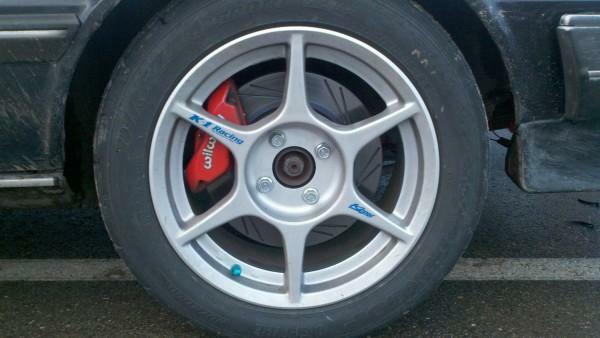 How about some 15" rotors and Aero6 calipers? Yep that mix is sure to put the lead in your sled. A great build with a customer supplied CPP front hub package on stock spindles. Nice hubs btw. Took the usual route with our dual plane bracket needs, dropped the caliper down a bit to give it a proper location, and fit it all up with some shiny parts and pieces. A killer deal for this customer. Final cost (customer supplied hubs) roughly $2500. Like other customers this one was having no problem finding what he wanted for his rear axle and had come into a Wilwood factory kit for it. But...it went all wrong for him as he tried to get a matching front kit. We fixed that and more. The final product on his spindles and using his old modified hubs came out great! The basics of our dual-plane brackets allowed for easy assembly and adjustment as needed. Look and function are what it's all about.We managed to provide both. 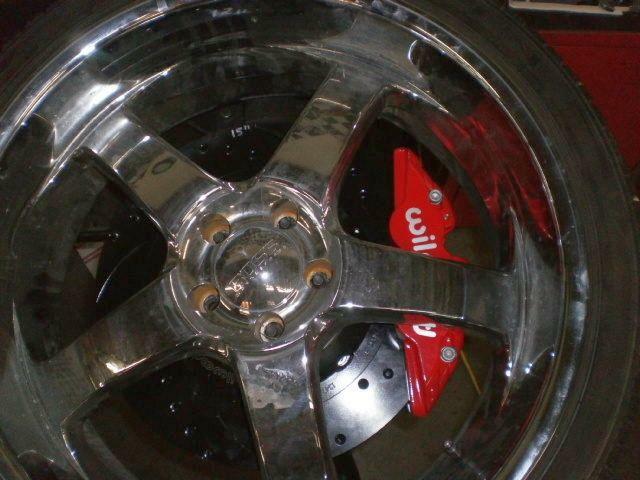 This a 14" AERO6 front kit, complete about $2500. Having heard of the work TCE does on custom builds our Canadian customer reached out to us about his 1967 Buick Wildcat. He wanted a front and rear kit worthy of the rest of the work being done on the car. His goal; a front and rear 14" kit with "matchy-matchy" appearance and fully functional for a 4000lb car. No problem here I told him; got it covered. Using data from him as well as a front spindle to build from we manged to get the info needed to produce the kits below. (Rear kit not shown in full form as I don't have the axle) The final fit and finish exceeded his expections and should provide years of trouble free service. Roughly $2300 per axle when completed. 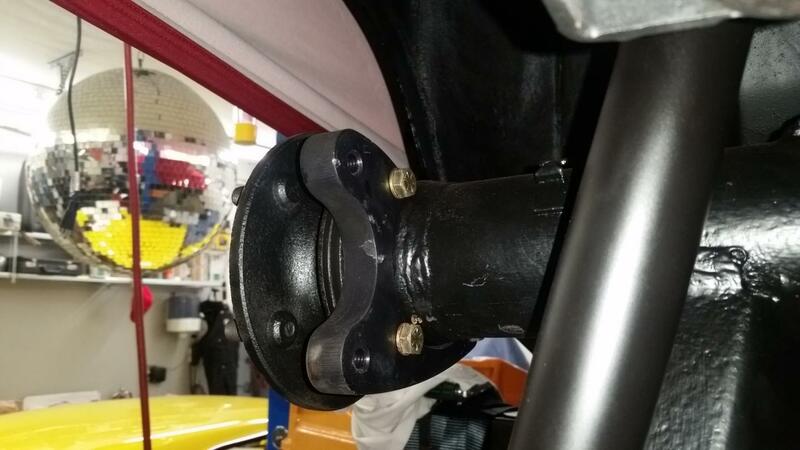 TCE has addressed a comon problem for SN95 Cobra owners: cars got a fancy IRS rear suspension... but until now there was little you could do for enhancing the rear brakes. With some work and rather complicated brackets we've completed our first "dual caliper" design with much success. Take a nice 12.88 rotor, fit some FNSL4 calipers to it and all that's missing is the parking brake. 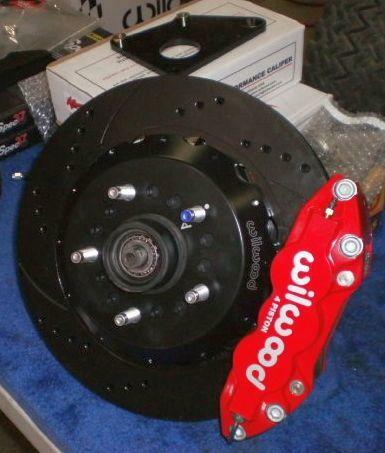 We fit that too; in the form of the Wilwood MC4 spot caliper on our custom made 2pc bracket. Took a couple of tries to find the right combo but I think we've hit on a truly stunning package. And at an affordabe price! Kits start just north of $1700 plus options. *Confirming this can be done in 14" also. 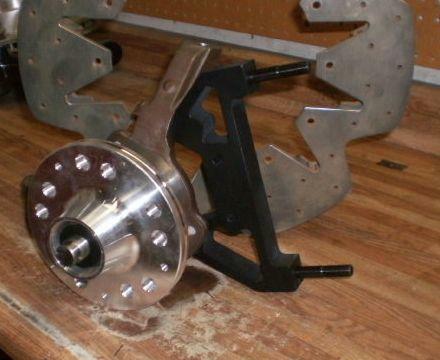 Another custom who purchased a Wilwood factory kit found his custom lowered spindles were not compatible with the kit...Still he wanted to keep the parts he had paid for and see what we could do the rework things to make them work on the custom spindles. 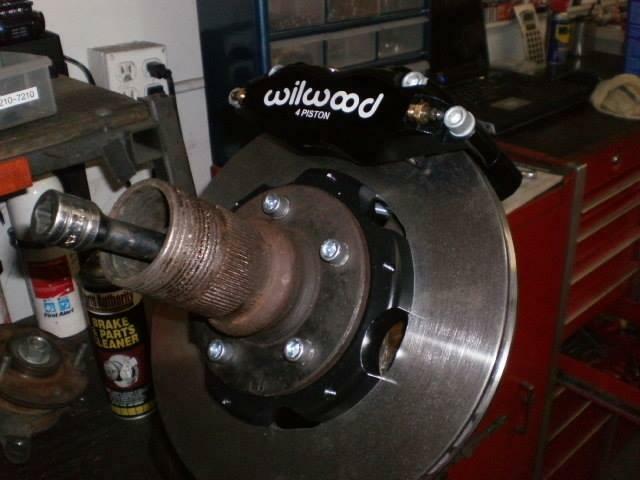 Saving the Wilwood hubs we fit new hats and had to fab up new brackets to make it all fit. The clearances were not condusive to keeping the brackets supplied. It also required some machine work and welding on the spindle as they were fit with some very odd 11/16-16 threads...that was just not going to work. We converted this to 9/16-18 and fit a set of our custom countersunk bolts to make it all fit. The multi piece brackets, hats and all the work took the project to about $1100 total. Probably not the cheapest way to get from A to B but in the end it worked out as planned. This T-Bird build took us to some 13" rotors and FNSL6 calipers. The end result was a simple yet very effective build. 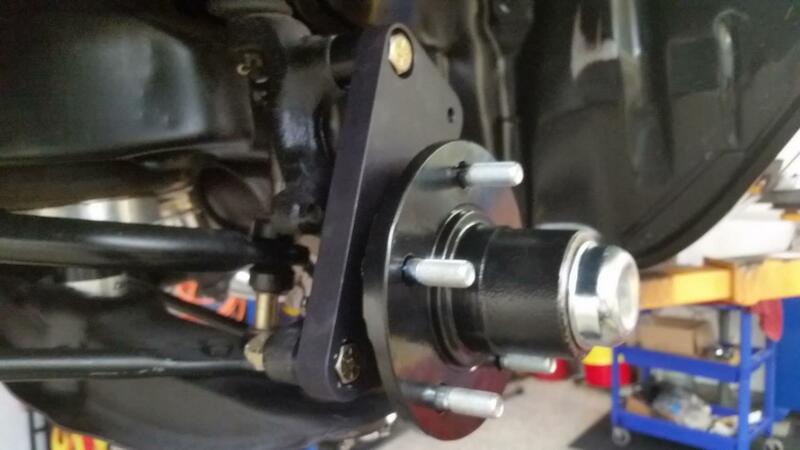 We upgraded the hubs with some new studs, designed the 2pc brackets allowing for both radial and lateral adjustmet. This is often crucial on older cars having seen variations in the hubs...we try to cover all the bases. 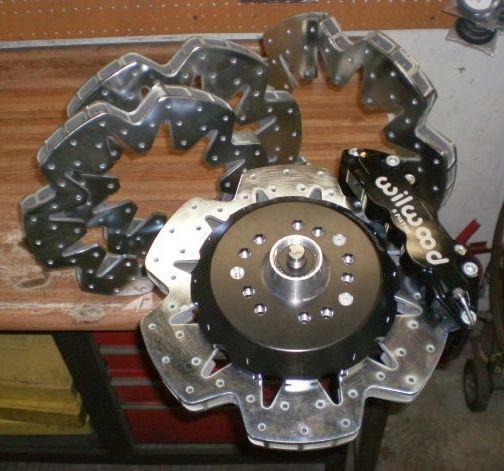 The 2pc hat and rotor slips over the hub using a Wilwood register ring. All that's left to do here is finalize the bolt lengths and hardware to be included in the kit. All told; about $1900 on this one. Wilwood Re Work a 1930 Cadillac! 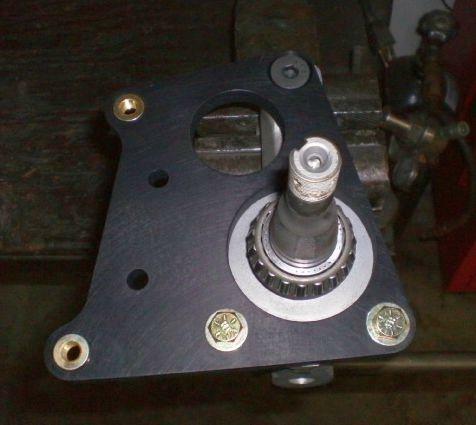 This customer had purchased a Wilwood factory kit and came to find it would not work with the spindles he had. Contacting Wilwood about what to do... he was referred to TCE. Our main goal on this one was to save as much as we could from the original purchase. 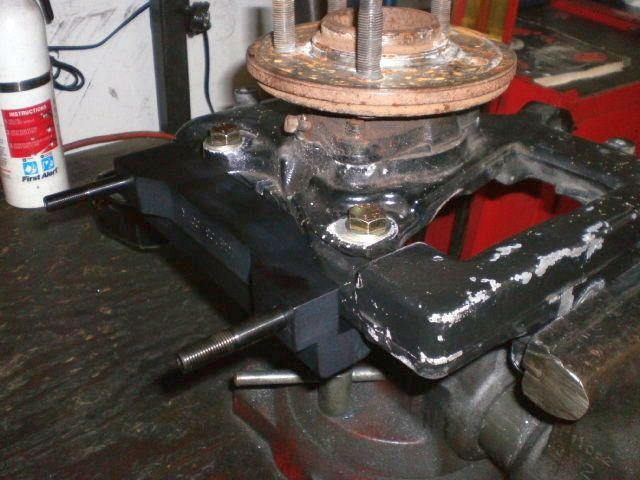 This required some custom mount plates which we incorporated to the supplied Wilwood brackets. All said and done you'd never know the kit was not a "white box" kit as things fit in place as you'd expect them to. Another simple project and happy customer. Buildiing a custom 14" six pot kit for a customer is not that hard...if you have the basics in place and the knowledge to do so. We took this old spindle, gave it some love and built our two-part bracket kit allowing for variation in 55yr old parts and then added the tried and proven FNSL6 caliper to it. Wrapped that around some mid weight 1.10" wide rotors bolted to aluminum rotor hats. The kit posed some issues with hardware as we reached out to Totally Stainless for some custom length bolts to pull it all together. But hey; it's what TCE does! Final cost: about $2000. 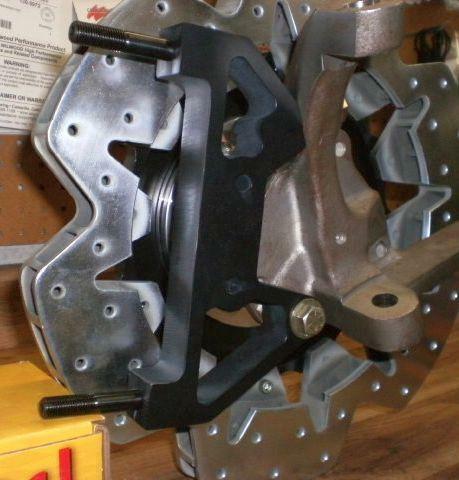 Many years ago TCE worked with another shop to cross fit some other rear drag parts to the V but it was fabricated as a parking brake rear kit. 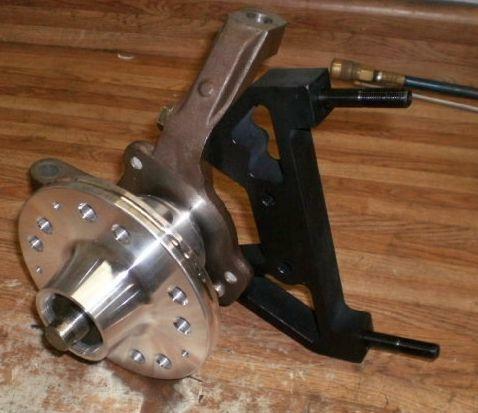 For this customer that was too much added mass and items not needed for his drag racing only V. With the parking brake parts removed completely TCE was able to design some 2pc hats and rotors and shoehorn a set of radial mount Wilwood Dyna Pro calipers onto it. A proven product on our popular SRT8 and Hellcat kits there's not a lot different about this kit- other than the weight loss. An extremely tight fit the build reqiures some of the massive aluminum knuckle be clearanced to fit the brackets low enough to mount the caliper at the proper height. Probably not for the average DIY buyer and not something that should really be considered for street, daily driver use. But for drag racing and speed trials where the demands are more linear than agressive and packaging and weight loss are crucial it should fill the bill nicely! Looking at about $1500 for this work. *Custom orange pc finish by customer. TCE did a custom front kit for this customer some time ago but who wants a front kit without a rear kit?? So....back to the drawing board. 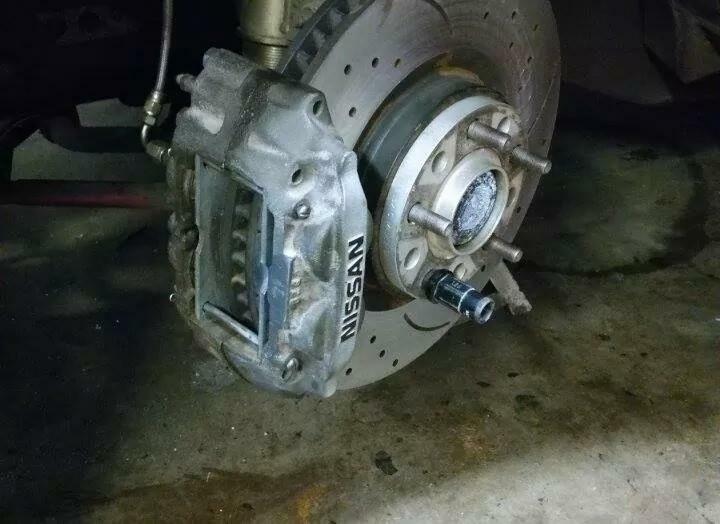 But the kicker: it needed to be a parking brake rear kit. Not quite as exciting as a giant six pot build but it was a necessity and not terribly difficult to do. Using the axle flange pattern we made end plates to bolt to the stock flange and the required radial mount brackets for the Wilwood Combo Caliper (serves both the hydraulic and mechanical needs) then wrapped that around some 12", 2pc hats and rotors. Again; simple and effective without breaking the bank. Will require custom cables to be made for the p-brake. Final cost: about $1400. 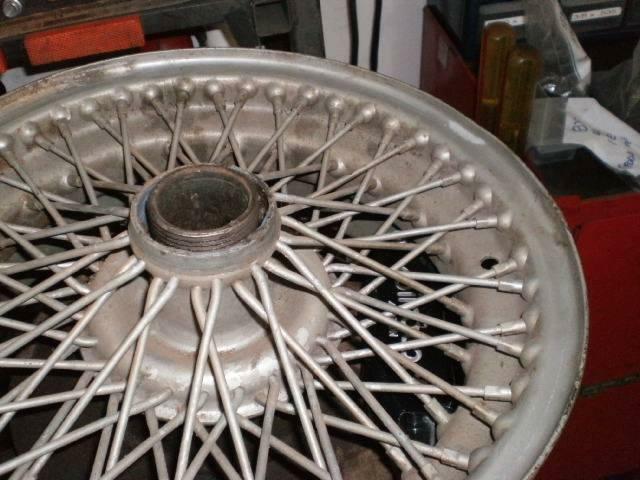 This customer had some circle track hubs he wanted to combine with his beloved 15" Bassett steel wheels. A tall order given the nature of the wheel. 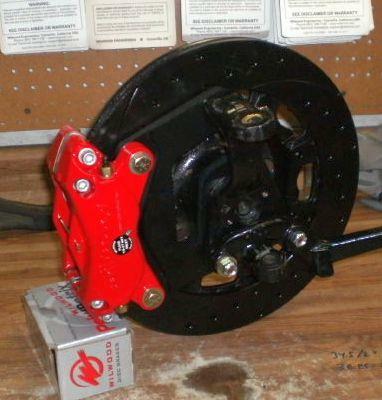 We settled on some 11.75 heavy duty 1.21" wiide rotors and large differential bore FSL calipers for his needs. 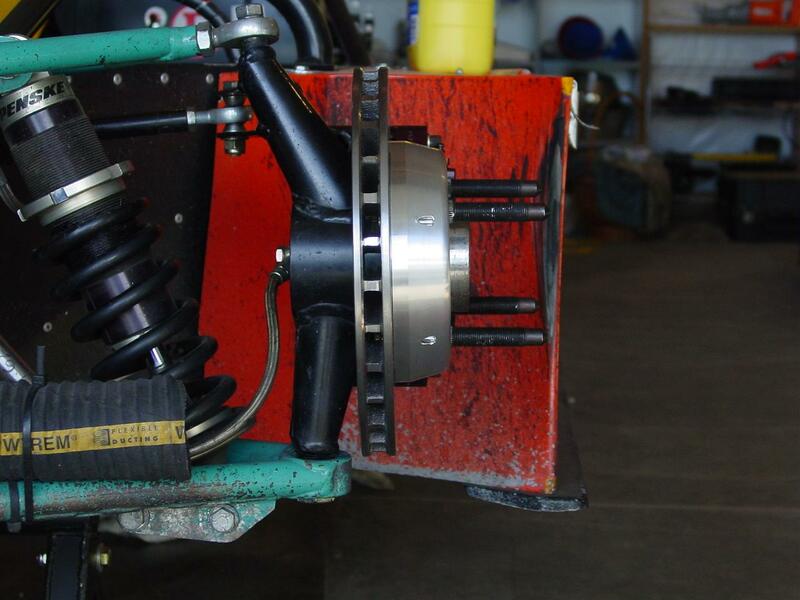 Overall about as much brake as we could fit inside that wheel and give him some performance on the truck. 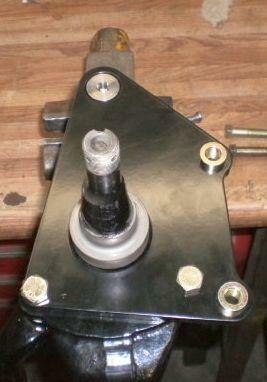 The rotor mounts to the "internmediate" plate direcly on the back of the steel hub making it a no-hat build. Common on many hub kits. The spindles required extensive modification to remove the factory caliper ears and create the mount bosses for a simple steel plate bracket. 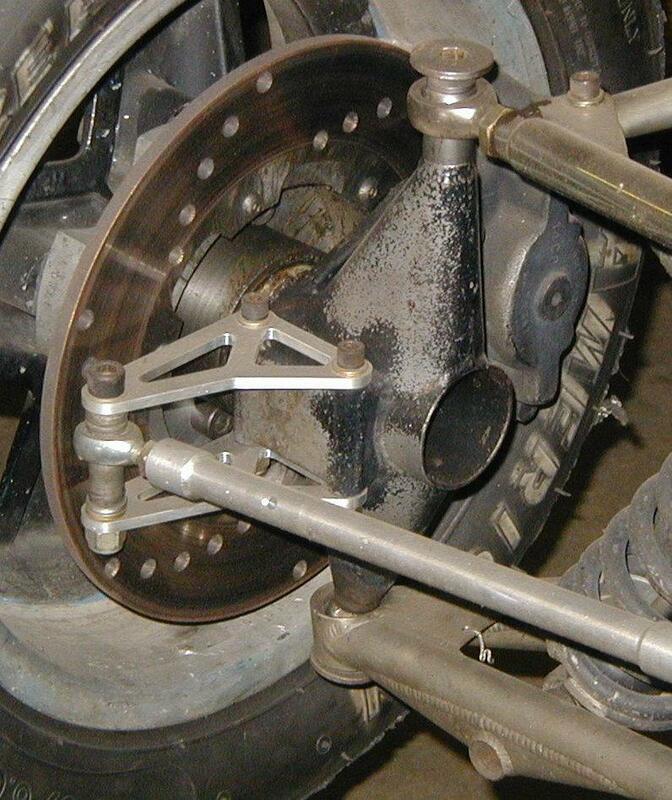 The caliper is then "reverse" mounted to the plate- a situation that's not ideal for competition use but given the bending moment location and on a street cruiser it proved the only real option. A kit I would have preferred to build on a much larger rotor and caliper...but he's happy to keep is jet-black wheels. Cost: rougly $1800 with spindle machinging and finish work. For years TCE has been a pioneer in the design and build of custom kits for the DSM market. First to make a 13" rear kit, first to offer front and rear dedicated Drag Kits...and now we've added one more option to the menu: Four pot, 13 and 14" rear kits for our NON parking brake customers. Gone is the heavy iron hat/drum for the shoes and in it's place a 2pc hat and rotor offering a lower weight, better vented and more efficient rear kit. If you open track your car you know heat is the enemy. This new kit addresses that with both a larger rotor and the aluminum hat to aide in drawing out heat for improved dissipation. 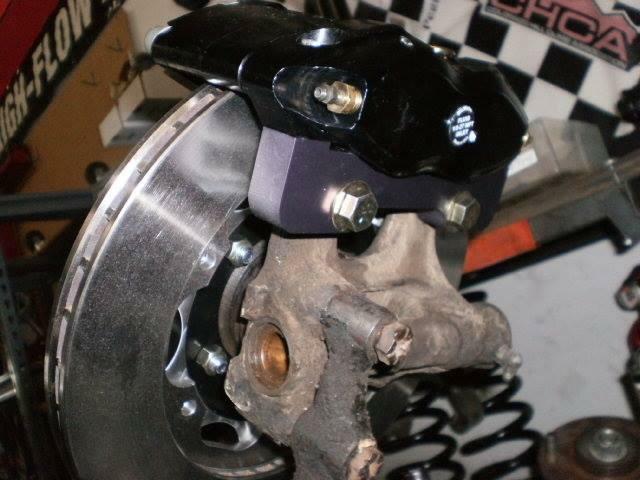 Add to tha;t more robust radial mount brackets and FNSL4 calipers than that of our p-brake kits. We've opted to build this in both 13" and 14" flavor to allow the 17" wheel market to take advantage of this great option. Pricing and details up on the 2G Eclipse page soon. Estimated cost $1700. What can TCE build for you? Remember these?! Quite the hot rod at the time. This one's running some Enduro time at ChumpCar and related events. The owner called telling me of durabilty issues for long runs, pad changes and simple overheating issues. Could TCE help? After evaluating options on fit, size, speed, mass we settled on a 13" kit with FSL calipers. The kit is fit with your custom 92HD rotor which are a fatter version of the common .810 width rotor but allowing fit of the same caliper. This to maximize rotor mass without the compromise of caliper clearance to the spokes. The Daytona has a very low offset requirement so this was cructial to the clearance needs. 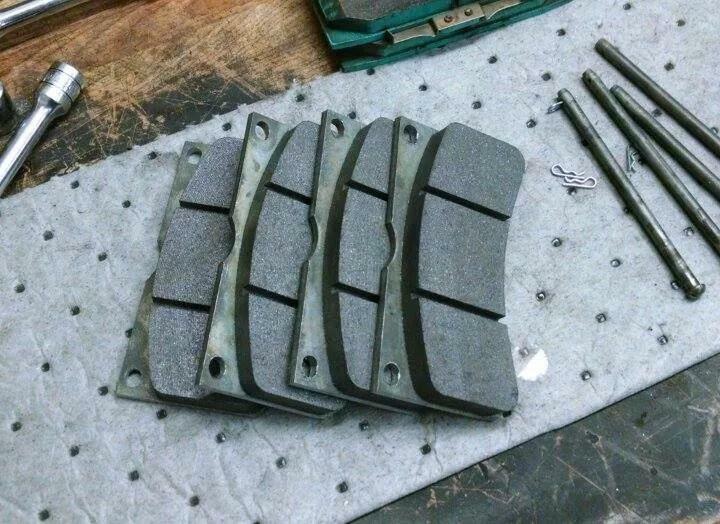 The FSL will supply a full 20mm of pad thickness which should last the guys a lot longer than the stock pads! Shipped with Poly B pads for initial run-in we will evaluate on pad options and any other changes shortly. 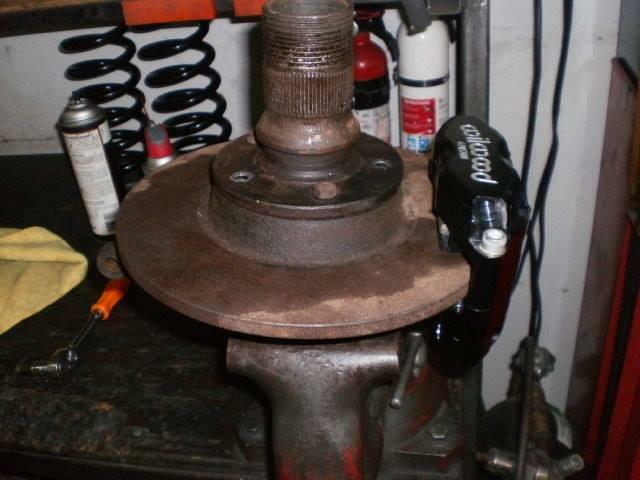 We also replaced a worn hub and bearing assembly. Final cost: About $1400. This customer came to TCE thru a common Wilwood referral. The car; an old Dodge(?) based drag car that was being de-tuned a bit for use as a Sunday Cruiser. 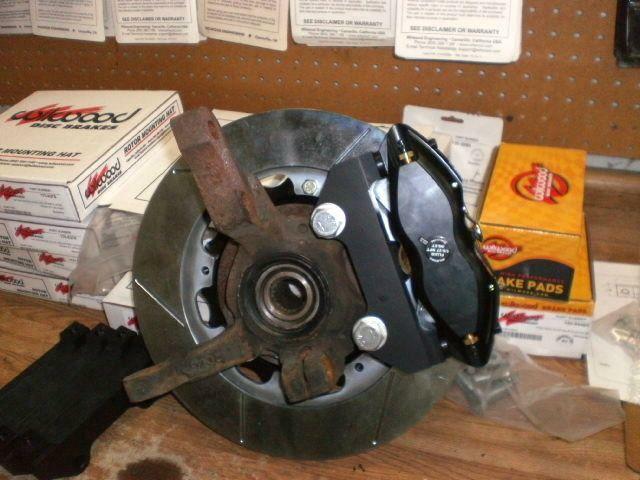 The old one piece rotors and worn out iron calipers just didn't cut it any longer. Our goal: bring it into the 21st century! 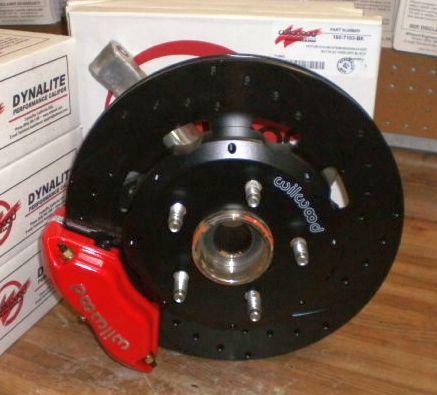 And that's exactly what he got: 11.75" rotor, Wilwood Dyna Pro Radial mount four pot calipers, custom hubs/studs and all the necessary items to turn the old machine into a fun driver. Now it'll stop as well as it went!! Told that this kit will find its way back to a late '80s truck however the spindles used are from a '97. The plan: a 14" kit capable of both stopping well and looking good. We reworked the hubs, fit some longer studs and did some BBK magic as always. 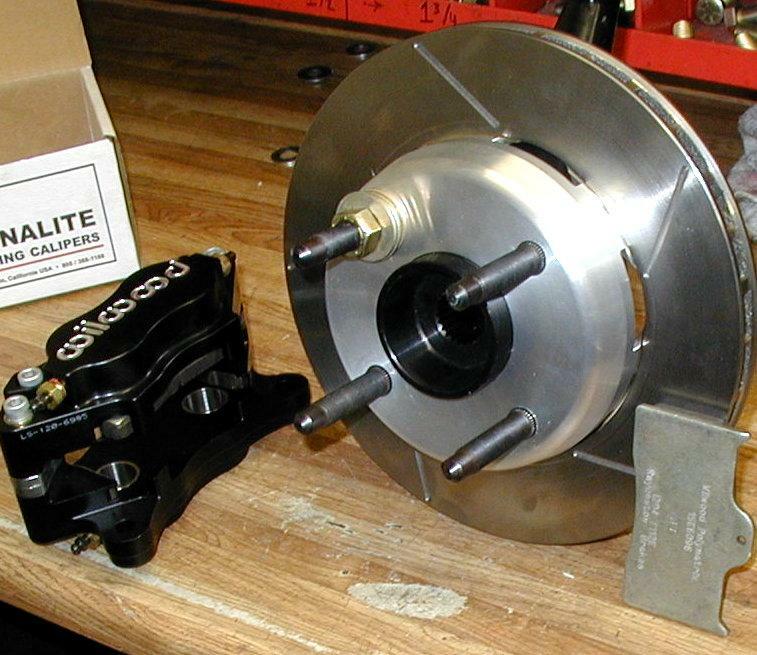 At 14 x 1.10" wide this rotor will supply ample brake torque and cooling for the daily driver street needs. We've combined this with the popular FNSL6 with its extended pad options assuring the customer of options to meet his varying needs. This kit as well as a smaller 13" version will make their way to the web page listing soon with pricing in the $1800-2200 range depending upon the build. A quick turn around on this one has a smile on our customer's face. Out with the old rusty, iron calipers and one piece rotor. 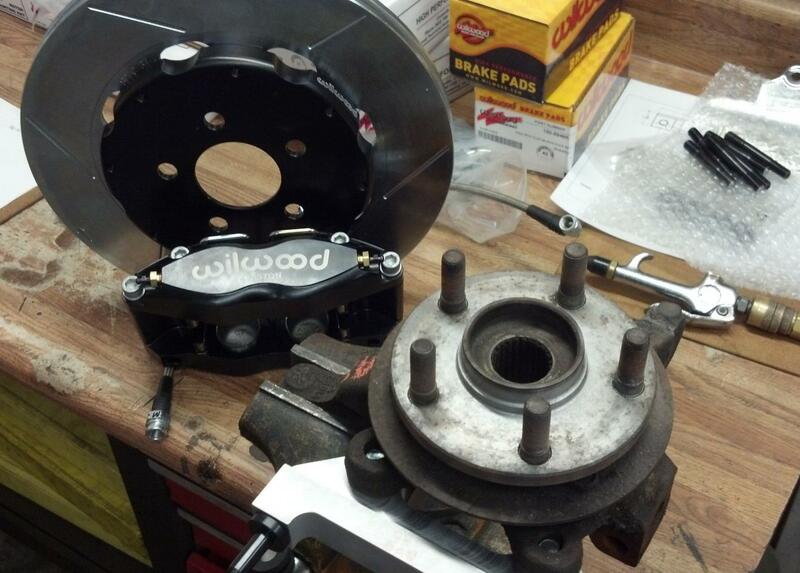 In with the Wilwood radial mount Dyna Pro and 2pc hat and rotor. A weight savings of nearly 10lbs per corner! This 'minor' upgrade offers about an inch larger rotor diameter, aluminum caliper body with ss pistons and a slight bump in piston area. 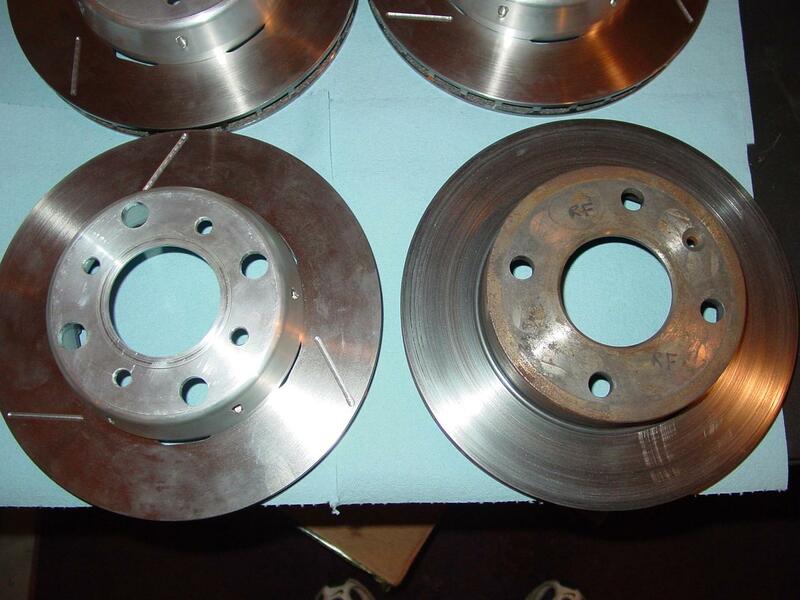 The net result about 15% more brake torque and greater thermal capacity. 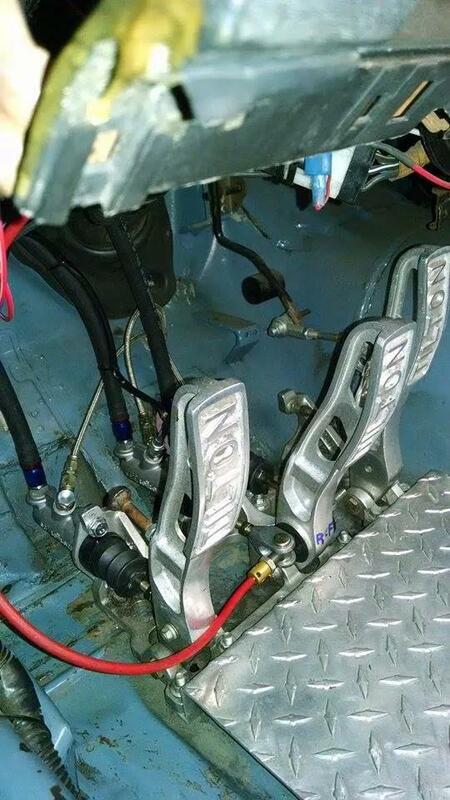 *Customer is going to alter his pedal choice and master cylinder size by his design. The final tally on this small but effective build: a bit under $1200. The Colorado presented a few twists to the common build: six lug and a modular 'reverse' mount hat made for some creative needs. Both the hat and the wheel stud circle need to be six lug, the hat now an intermediate plate bolted to the back side of the hub and bolted to the back of the hub. A locker plate was added to back up the plate to limit stress and deflection. Once that was out of the way..moving to the conventional radial mount bracket allowed for some easy fit of a nice six pot W6A caliper on a much wider 14 x 1.25" rotor. Overall this package proved a winner at an affordable price of about $2000. *W6A no longer available, now Aero6 with small price bump. 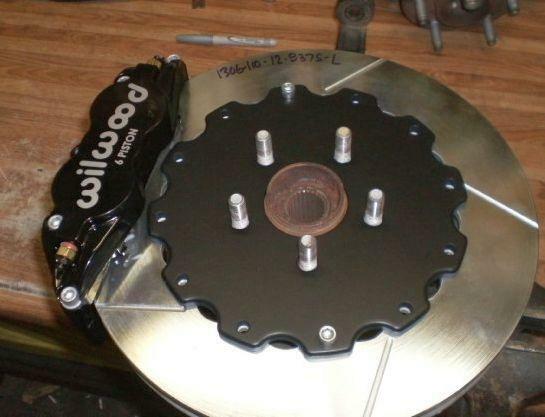 A customer who had purhcased a Wilwood Ford 9" rear catalog kit wanted something to compliment it on the front. 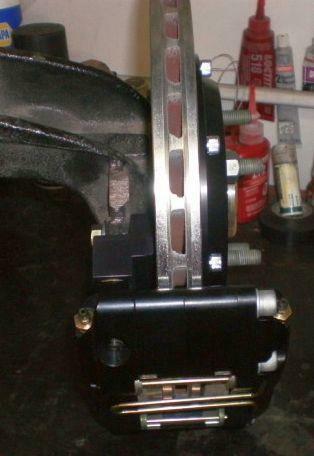 Two factors here were critical; cost and the use of a matching FDL four pot caliper. While not my first choicse for such a vehicle I took it up on myself to meet his challenge. 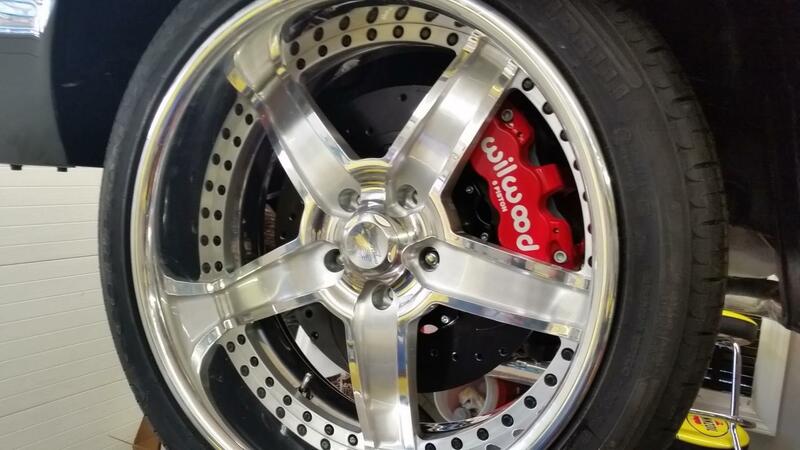 We found some old hats here that needed some refinisihng work and paired them to a 13 x 1.10" rotor, fabbed up some billet lug mount bracket and had custom FDL red calipers made up for this kit. The fit took some futzing to make it all fit as this is not a common combo. But in the end it's wrapped up and should produce mile's o smiles for tooling around town in his fun ride! Final cost...about $1100. Spindle mods, new hubs and some good old fashioned engineering leads us to this front C1500 kit for our customer. 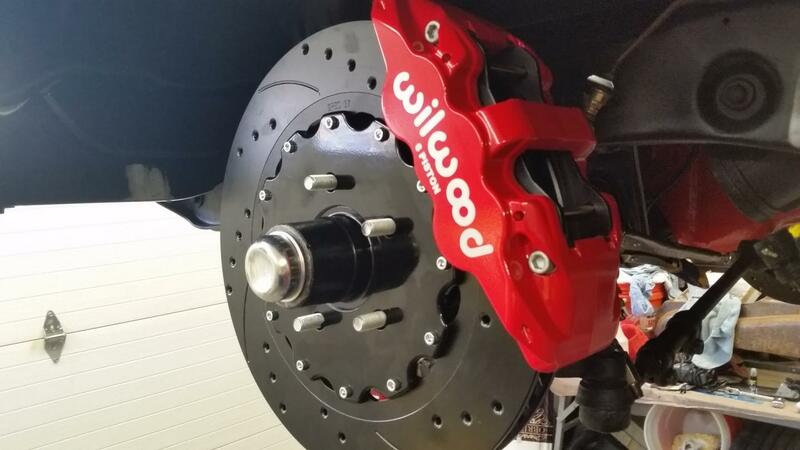 A light modification to a stock Wilwood rotor hat, add some 15" drilled and slotted discs, and then top it off with a set of W6A red calipers. Fairly simple build but the spindle time was a challenge with non standard spec mouting holes to work with. In the end tho a complete kit coming in at about $2800. Big wheels..need big brakes. This 2005 Explorer running on 22s just needed some help in the brake department. We settled on 15" rotor rather than 16 for cost. The new Aero6 calipers offer an exceptional value for the money when paired with these chosen cross drilled and slotted rotors. 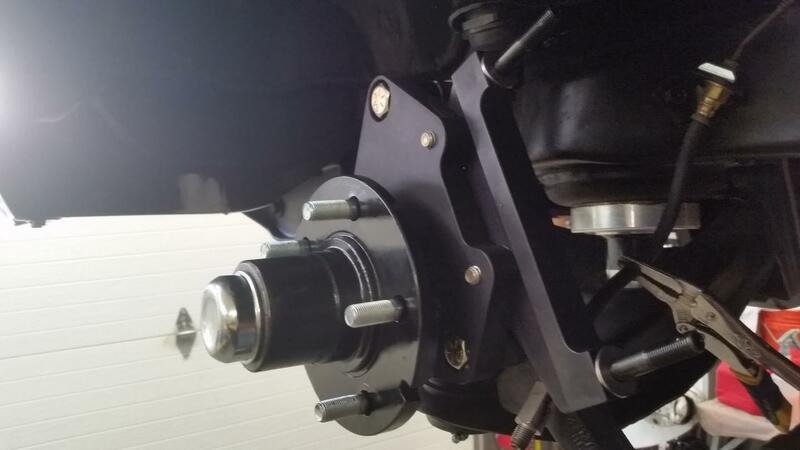 Our TCE radial mount brackets were a bit of a chore given the need for dedicated right and left brackets- the Ford spindle does not offer universal mounting as many cars do. But with some futzing we were able to make them both fit but strong. Next up: matching rear kit! This project presented new challenges! The customer wanted "something wild" that would show the best and be functional also. 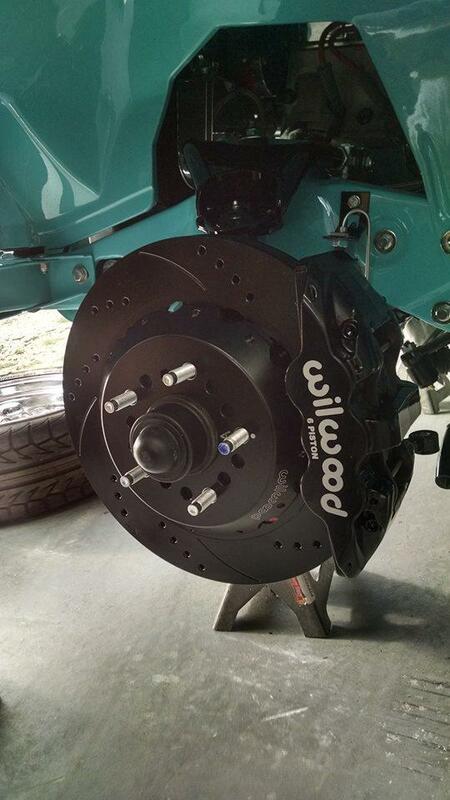 TCE fit the bill with custom 14.5" front and 15" rear fully scalloped discs with W6A front and W4A rear calipers. The rear started life as a stock Wilwood rear axle kit and retains all the inner parts for future use as a street machine. The rotors were totally waterjet cut and came out great. This kit was not intended for street use with these 'rings but the entire package was built to allow an owner to quickly swap full discs at any time and make it a street machine. A four wheel kit engineered for 15" wheels and light weight. 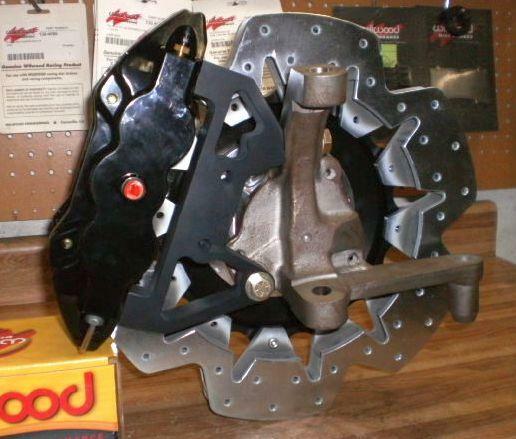 A cool project that came to be a near 50/50 brake bias design. Light weight UL32HP discs with FBDL calipers bolted to Corvair front spindles and the rear on a late model FWD set up due to the cars mid engine V8 layout. The system was engineered for a twin master set up and adjustable bias bar. The customers goal was a V8 Corvair tipping the scales at under 2000lbs. Don't know if he got there but the weight saving on the brakes was huge! 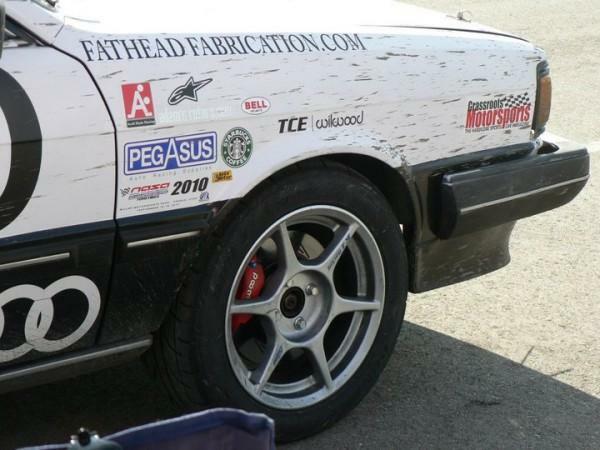 A customer knew of TCE's experience in SRT4 builds and called to see if we could do something with his Stratus. While they share some dimensions; hub bore, wheel stud circle..the rest of the project is pure Stratus. This one took some custom made hats and radial mount brackets to build on the customer supplied spindle. The result; a simple and successful project. 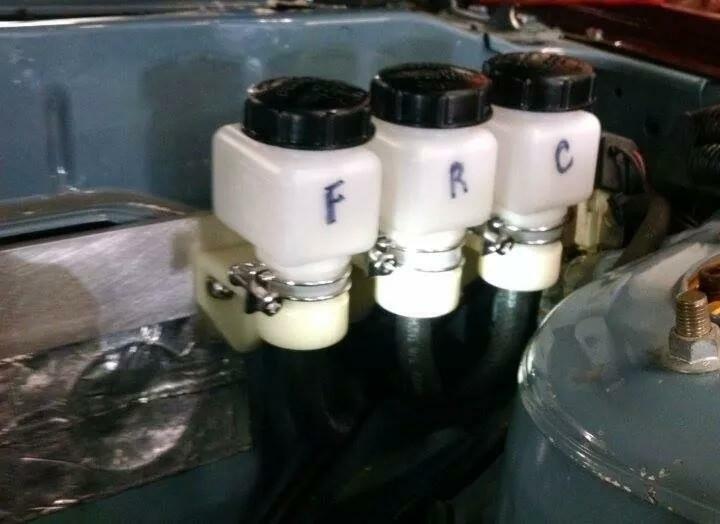 This project was fun to do as the car, like the Corvair offered a near ideal 50/50 bias opportunity and was to be used with the stock master cylinder. 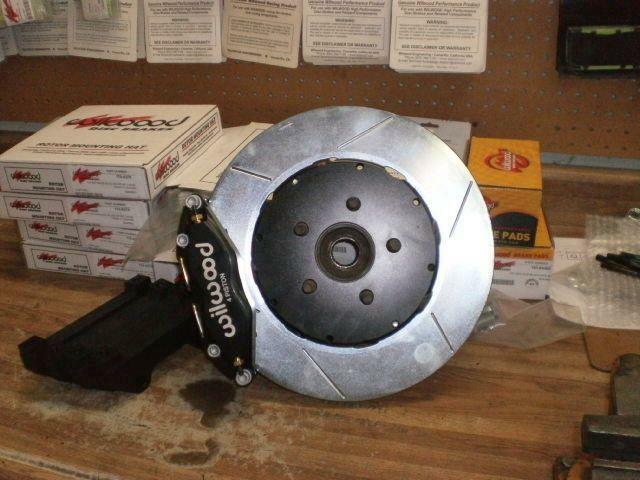 We discussed options with the owner and built a system based upon the radial mount DPr caliper thus allowing the rotor to be changed from either 11.75 or the supplied 12.2" discs. Why? 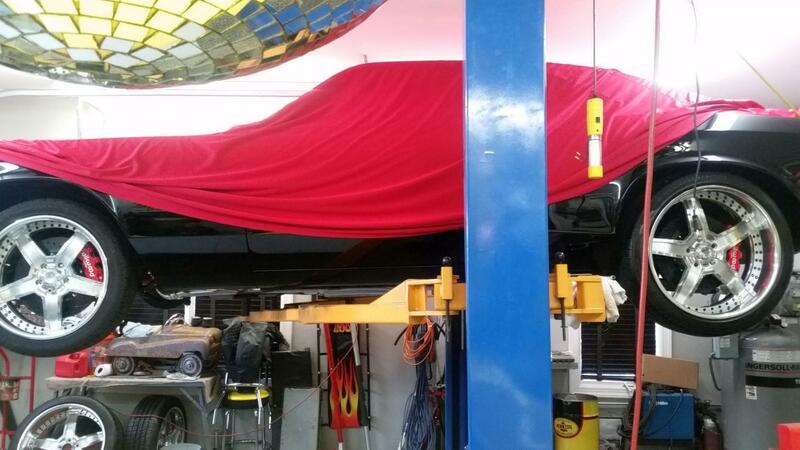 To allow the car to be fit with 15" wheels in the future. This kit was built using the GT casting as it's expected to see track time. The owner wanted to replace his heavy one piece 10 disc with something both lighter and more efficient. The vehicle, used for both street and occasional track days has been fit with 11.75 GT rotors and radial mount DPr caliper. 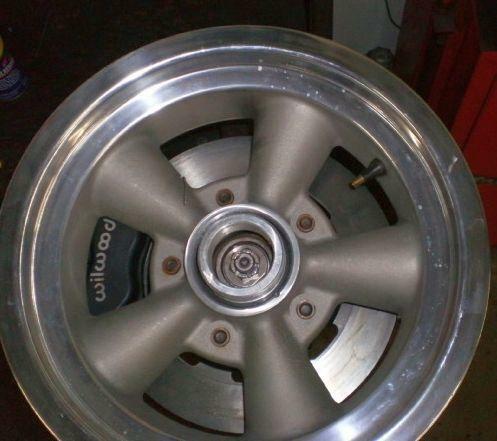 Like the Consulier project we targeted 15" wheels to start but the owner wanted to be able to go larger. 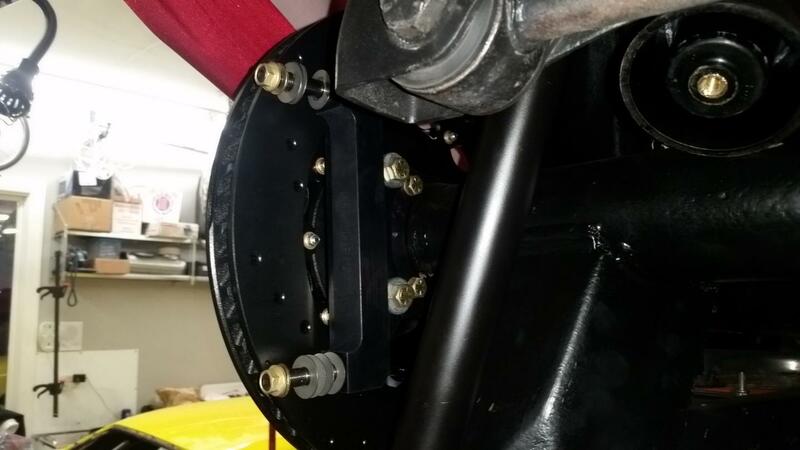 Thus the brackets were designed to be fit with optional barrel spacers when installing larger 12.2" rotors. These guys were looking for fun and affordability. The custom built FBDL kit got them both. 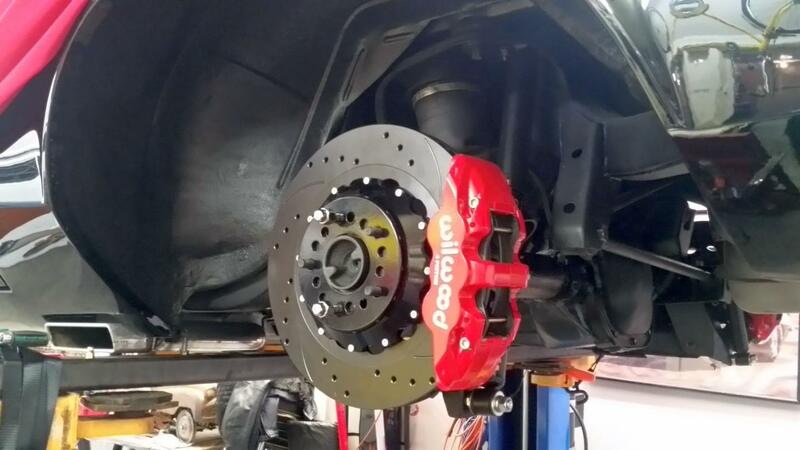 With their spindle in hand and the desire to run a one piece rotor TCE took to making the proper bracket and spec'd the (red of course) FBDL four pot caliper and pads to their car for competition. The results were great as they reported no fade issues and great durability . And tons of fun! 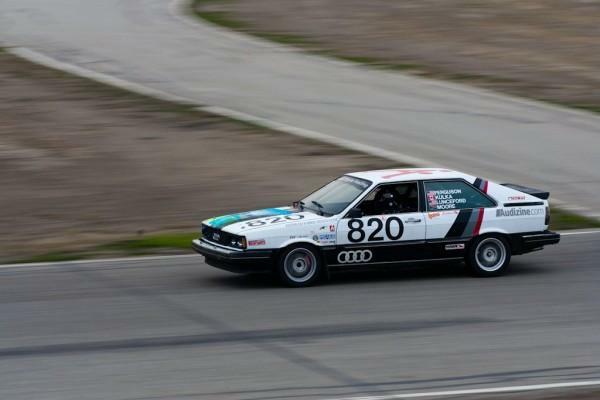 Back in the day...TCE was well known for work on Open Wheel cars- especially Formula Fords. This Tiga came in with some really torn up parts. 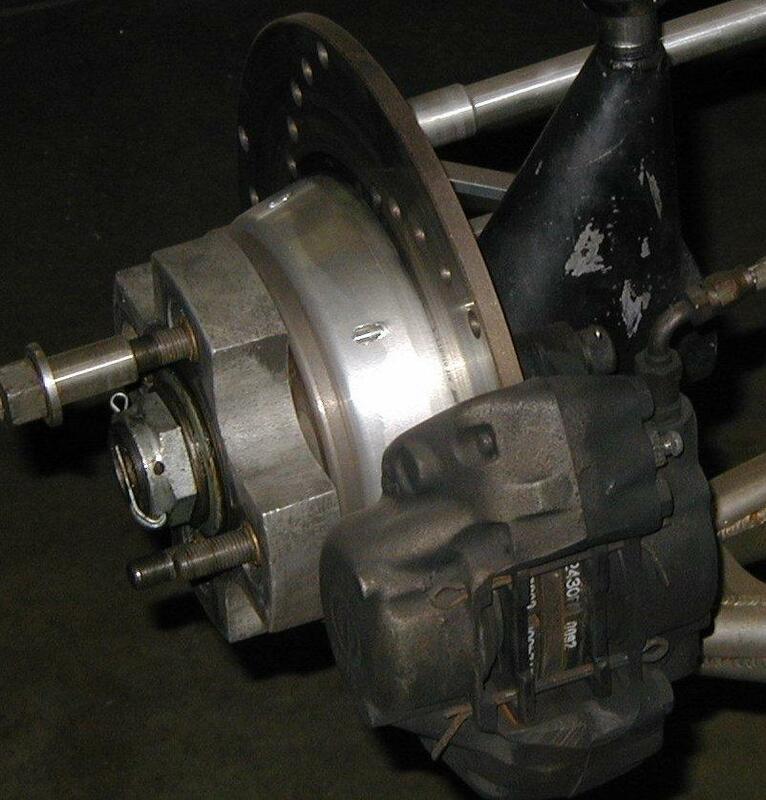 With some effort and parts TCE reworked what was left of the front brakes to include new hats, rotors and a hub rework. On the rear we reworked the entire upright to share parts with the plentiful Formula Mazda! 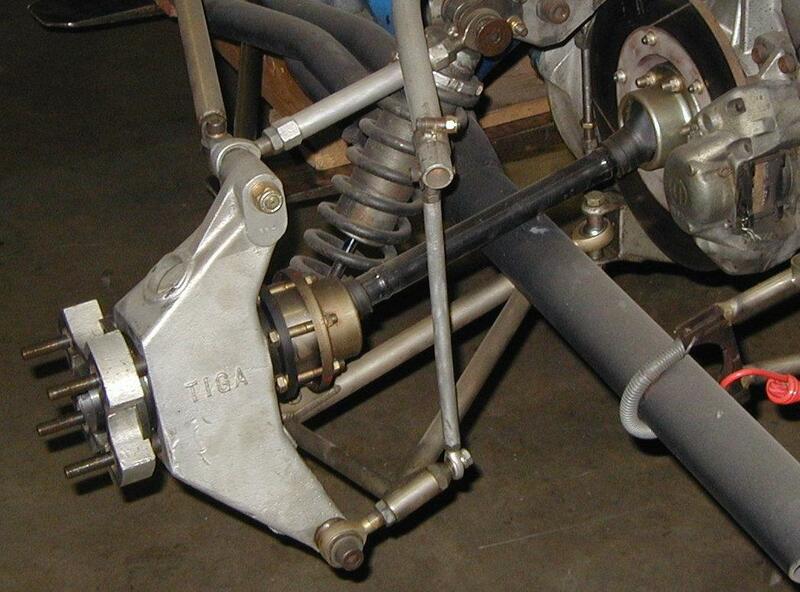 The uprights were bored to spec for the FM bearing package, the FM hubs, stub axles and bearing spacers all machined to fit in the upright to match. The result; no more rear hub failure and a bullet proof package. So successful that it was later copied by a number of others once they saw it! Radical Sports Racers have been around a while. 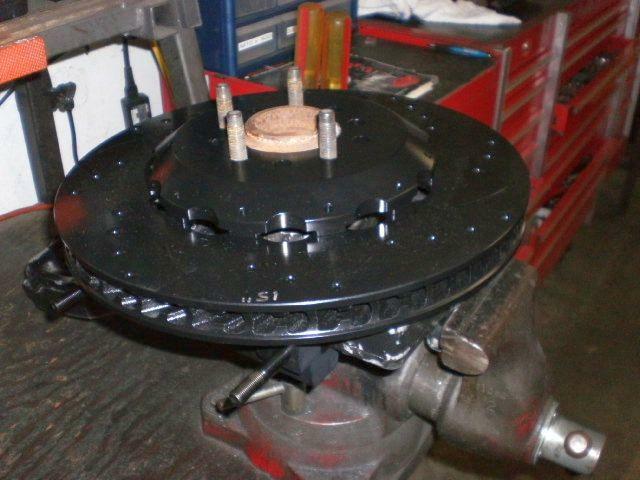 When it came time to do some revamping of the stock brakes a number of owners contacted TCE about helping them modify the one piece English Ford rotor over to 2pc and work on some caliper changes. One of a few mock ups image found right now, looking for more. Hill Climb regular Rodney O'Maley needed some work done to the front of his damaged car a while back and at the same time tasked TCE with building something not only lighter but more effective than the stock production car parts he had at the time. We mated some cool, scalloped rotors to aluminum hubs, fabbed up mounting brackets for his spindles and added the proper four piston calipers. The total weight saving was significant and functionality superb! The call came in: "Can you help me with some old vintage drag race brakes?" Sure! So the arrived and in rather worn out condition. They left: Good as New! These sold discs are a lug drive to the aluminum hats and held in place with a spiral lock on the inside making them a floater set up. 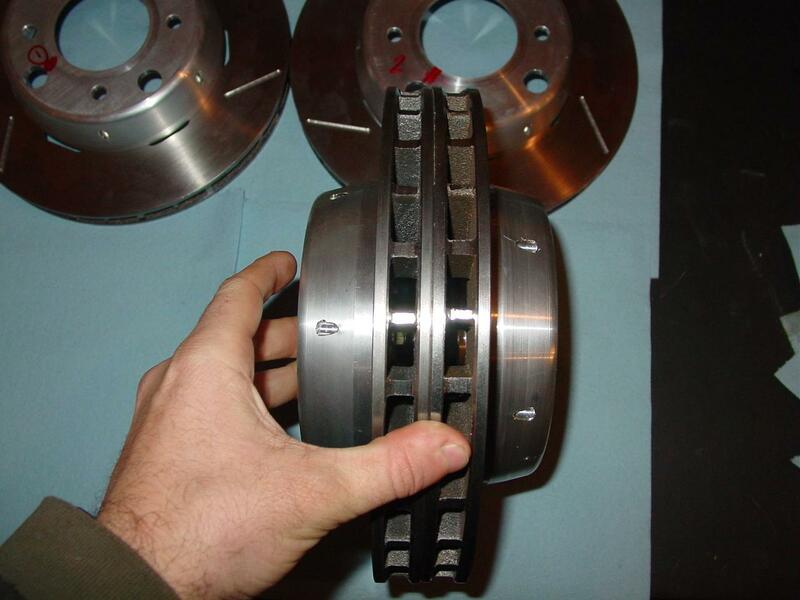 Knowing the Mazdaspeed 3 front knuckles were the same as this customer's Mazda 5 van we discussed some options for installing slightly larger and better brakes for his daily driver needs. Settling on the common 12.2" disc we went to .98 wide, directional cast discs (without slots to keep the dust down) and paired them with some radial mount, four pot Dyna Pro radial mount (DPr) calipers. Custom brackets and ss braided hoses tie it all together. This should clear up any brake fade issue and assure the owner of a firm and responsive pedal feel day in and day out. Est. cost $1300. Wanting something a bit more modern that the twin piston Girling calipers that came new, this customer opted for both a bit larger and fully vented rotor as well as the popular radial mount DynaPro caliper. A nice four piston options offering the best of fit options as well as good looks and lighter weight. TCE is no stranger to Pikes Peak. When Professional Stunt Driver Susan Purkhiser wanted to run her 240SX up the road in 2015 she knew some freshening of the brakes was in order. While we have yet to convert this car to any of our TCE/Wilwood products, the car has been fitted with all new master cylinders, remote reservoirs, custom Poly B race pads up front as well as some specially built rear pads. The new set up required a complete overhaul of the pedal area as all things were taken apart and given the green light for use. The stock front Nissan calipers got new seals and the rears were replaced completely due to the massive amounts of rust and crud in the entire fluid system. Future changes will likely bring a more conventional TCE 13" front kit with FSL calipers and larger vented rear rotors. Not often you get to work on some good old American Iron like this cool ride! When Dom called telling me what he had and what he was looking for it was a natural. The front was converted from Drums to 15" Wilwood rotors and Aero Calipers. The low back space meant not only custom 2pc radial brackets but a zero offset hat was needed. TCE built up this flat plate as a simple and cost effect way to make it all work. With a little work on the hubs and some paint on the old spindles this ride is not only looking good, it's going to stop like nobody's business! So what do you do after you fit a wild, custom 15" front kit to your sled?? A matching rear one of course! This rear kit shares the same 15" rotors with alternate but matching hats and properly proportioned rear four pot calipers. All fit to modular 2pc brackets making install a snap! In this case we opted to omit the parking brake as the overall size was more important. 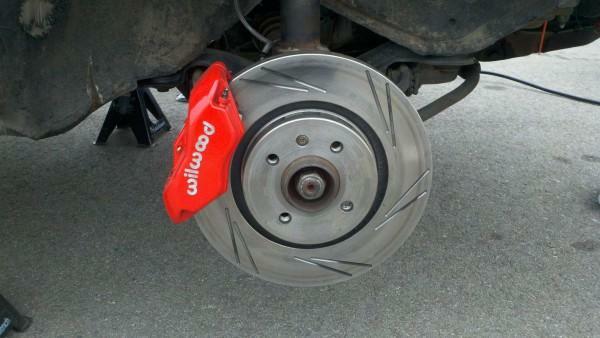 Most parking brake kits and or calipers top out at the 13-14" range. Overall...a wise choice really. And why would you want to PARK this ride?! The Devon C is a 'kit' car of the early type. Long before such terms really existed. This customer has an older model C - of which means Corvair. While there's no Covair motor in it, the front spindles are in fact right out of about 1963. Given TCE has done Corvair conversions before this project came to us via Wilwood who simply didn't have time to spend on it given the one-off nature of things. 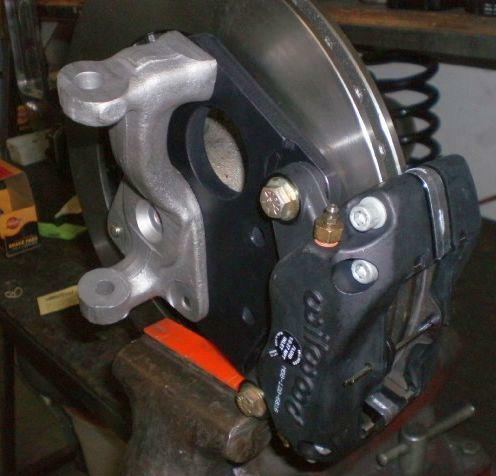 TCE took to it quickly and applied some of the former Corvair magic elsewhere on this page promptly fitting 12.2 UL32-HP discs, FBDL calipers and our own brackets and hat mods to make it all work. A few tweeks were needed to fit the custom knock-off center section such as an oversized register ring to keep it captured in the machined center. Overall fit is extremely tight to the wheel. Also added were openings for future cooling ducts should they be needed. Our customer was able to source a rear Wilwood factory kit to fit his rear axle but was left high and dry for a matching front kit. No problem! Some sourcing, custom work, properly pairing to the rear kit purchase this Pontiac will stop like it should! 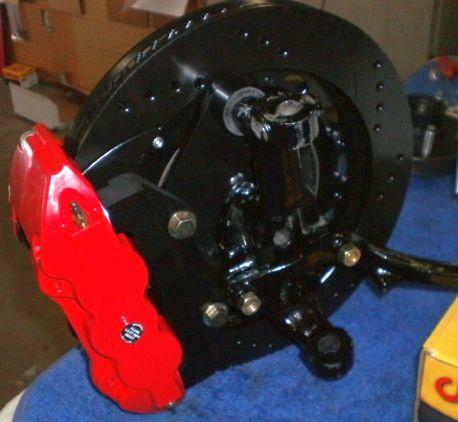 Complete front drum to disc conversion came out well with installation for the customer quick and easy. See what TCE can do for you! *Customer final color choice was black. A new T-Bird project emerged in December...this one a front only 13" FNSL6 design for a customer and his 17" wheels. We'll be pairing this, both visually and functionally, with a Wiwood factory rear kit for the complete four wheel make over. This a fairly straight forward build using our steel base plate and a radial adapter bracket fit to this allowing for adjustable fit both radially and latterally on the spindle. 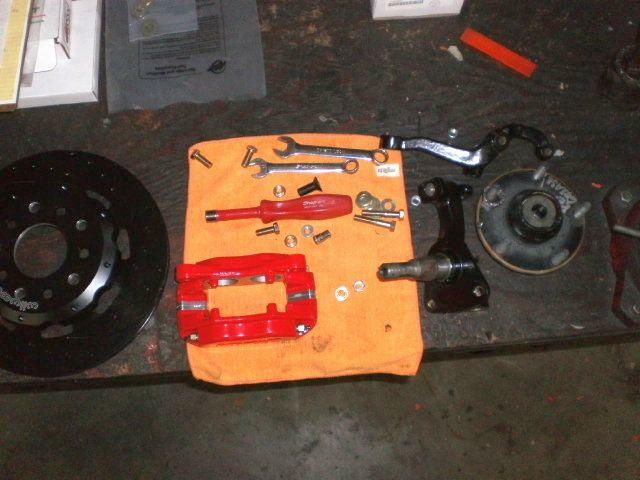 Of course the spindles were powder coated, plates plated and caliper done in red. 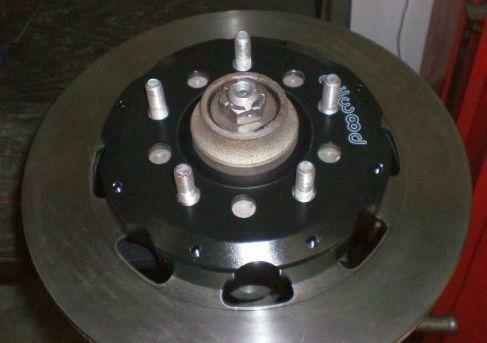 The REAR big brake kit, shown in part, for the 15" kit at the top of the page. This one was a bit of a pain...mods were needed to the cast iron knuckle requiring that the entire bearing be serviced as well as longer studs fit. Quite the chore, but in the end it produced a finish 14" rear kit with common ajustable mounting, a fully functional parking brake and the looks to make the customer happy. Once again; TCE came through when nobody else could. 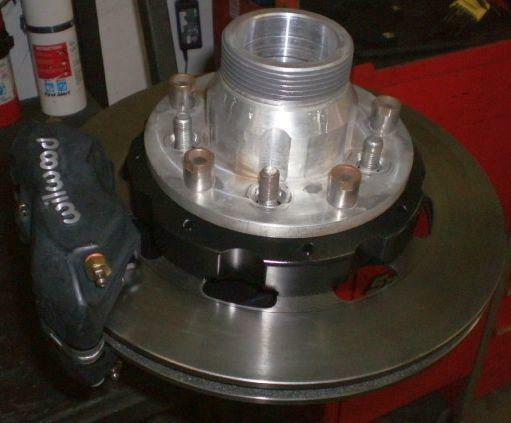 Quick build: a radial mount DP four pot caliper for a customer to run on his 4000 with Focus 11.8" rotors! Simple, effective and inexpensive: about $800.